Recently a friend from church had a baby. I wanted to make a dinner for her and her husband that would be comforting and remind her of her home country of Brazil. 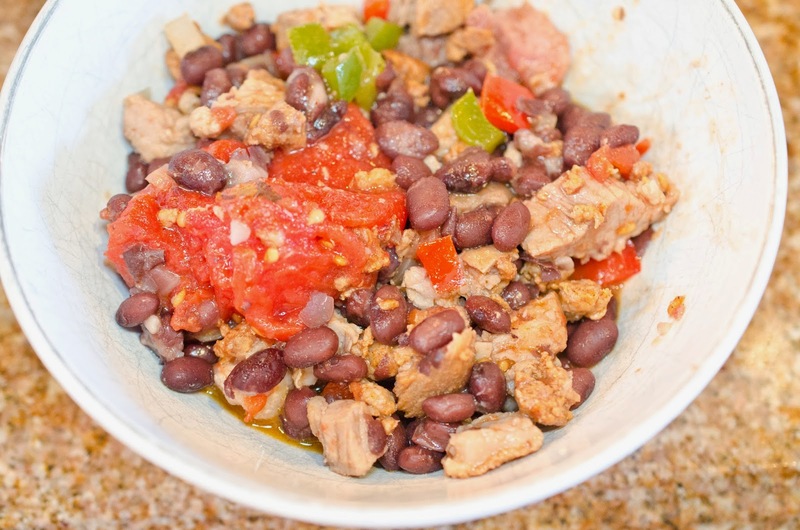 When I was looking up recipes from Brazil, I learned about a Brazilian Black Bean Stew, Feijoada. Since I had all the ingredients to make the stew, it was a win win. We had leftovers, so on another night the stew got an upgrade and the recipe below is the upgrade. This stew was very delicious, so much so, that my husband requested I make it again for a church social. I made it this afternoon, third times the charm for our church Halloween Party Chili Cook-off. I added some pepper flakes to the recipe to make it more like chili. I brought this "chili" and blew away the judges and won first prize. I think they liked the three kinds of pork, not a traditional chili with beef. This recipe can be made very easily, and cheaply, depending on your preferences. At a nearby grocery store, we have blemished discount produce that isn't perfect enough to be sold with the other pretty produce. On a wonderful whim, I looked at the discounted produce at my local grocery store and struck cheap produce heaven and found bell peppers to use for this recipe. Look at all that pork, so very yummy. Soak black beans over night in water, 3 inches above beans and 2 tablespoons kosher salt. 30 minutes or on the stove simmer covered for 1 hour or until beans are tender. on a rack set into a roasting pan. 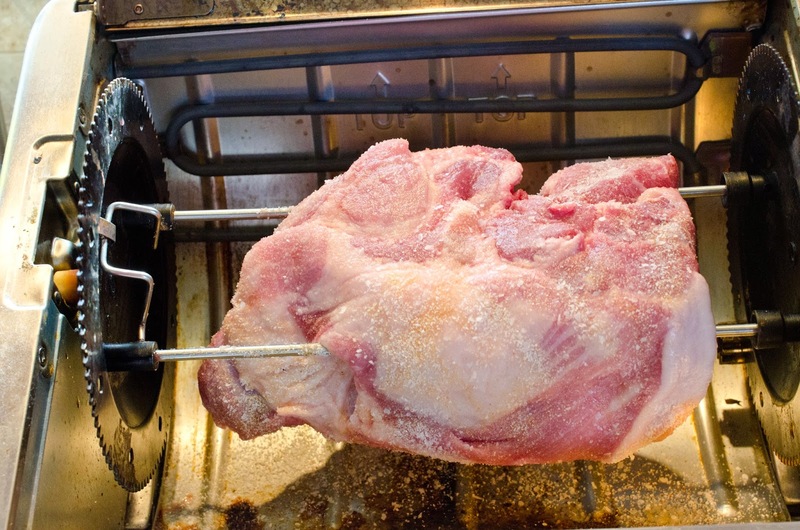 Roast for 20 minutes, and then reduce the heat to 325 degrees F. Continue to cook for 3 hours. not have a ham bone with leftover meat on it substitute a ham steak. fried, remove cooked fat when fried. Leave the melted fat in the stock pot. in the large stock pot over medium low heat. heat in a large 12 inch skillet. Cut roasted pork into 1/2 inch cubes. 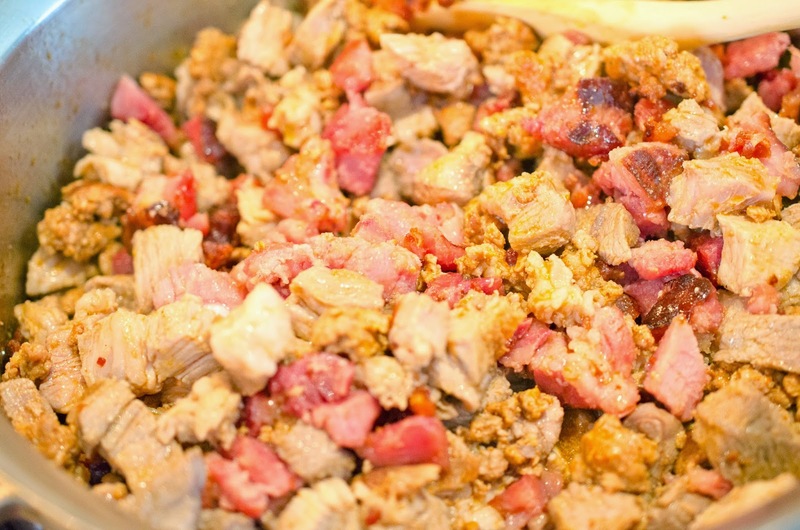 Place ham, fried fat, and pork in the same pan as the chorizo. and cut with a spoon. Stir and add red pepper flakes. Cook over medium heat until bubbling. it is great as a chili. 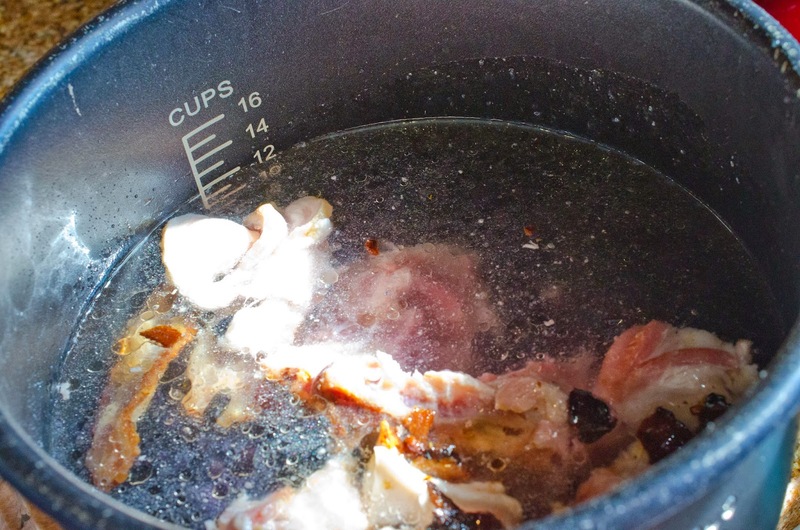 Cut up the bacon into 1 inch pieces, add bacon, ham bone (remove meat and fat), soaked beans to a pressure cooker pot or a stock pot on a stove. If you do not have a ham bone, add more bacon. Pour enough water to cover beans by 3 inches. Cook beans in pressure cooker on high for 30 minutes or on the stove simmer covered for 1 hour or until beans are tender. 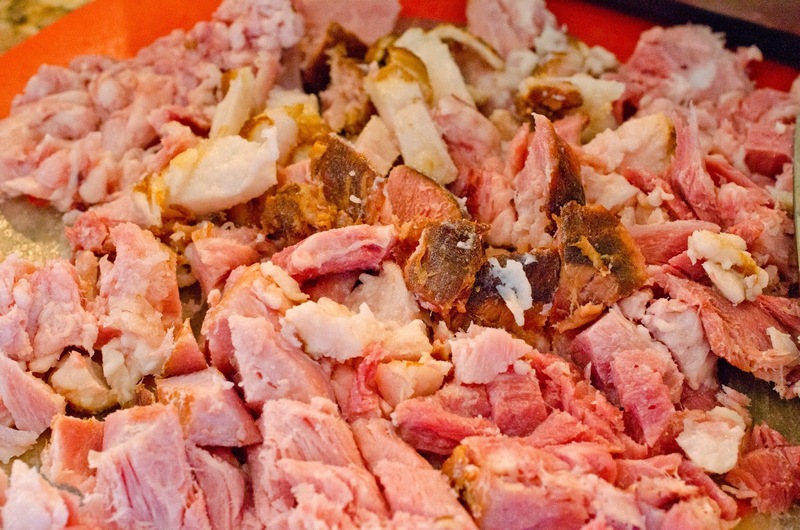 Remove meat and fat from ham bone and cut into 1/2 inch pieces. If you do not have a ham bone with leftover meat on it, substitute a ham steak. 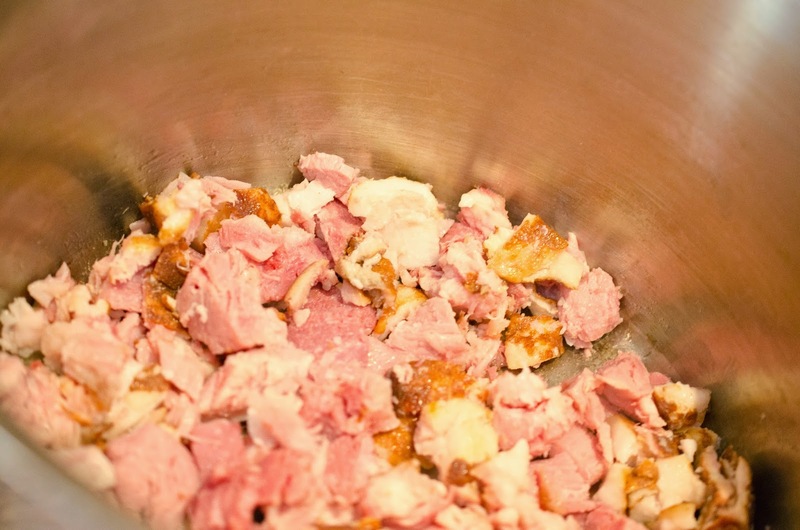 Place ham and fat in a stock pot over low heat. We are rendering the fat (melting the fat), although fat is yummy, it is better melted than having to chew it. Remove meat when slightly fried, remove cooked fat when fried. Leave the melted fat in the stock pot. 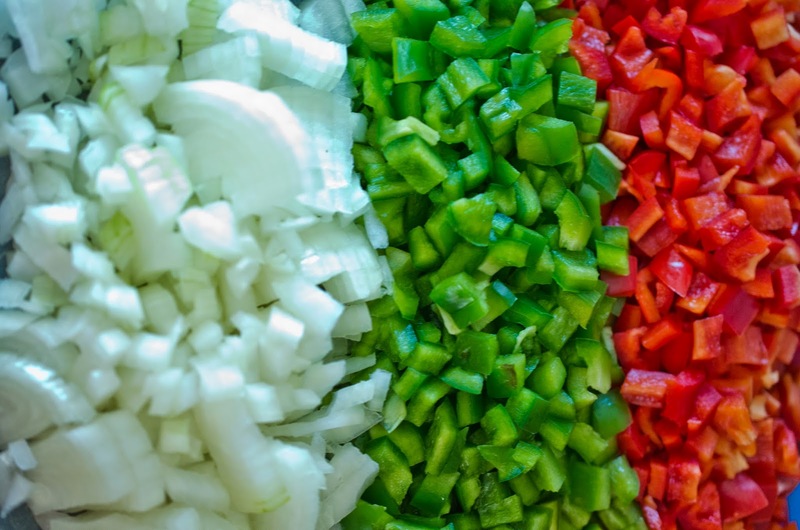 Dice the onions, and bell peppers. Saute the onions and bell peppers in the melted pork fat left in the large stock pot over medium low heat. 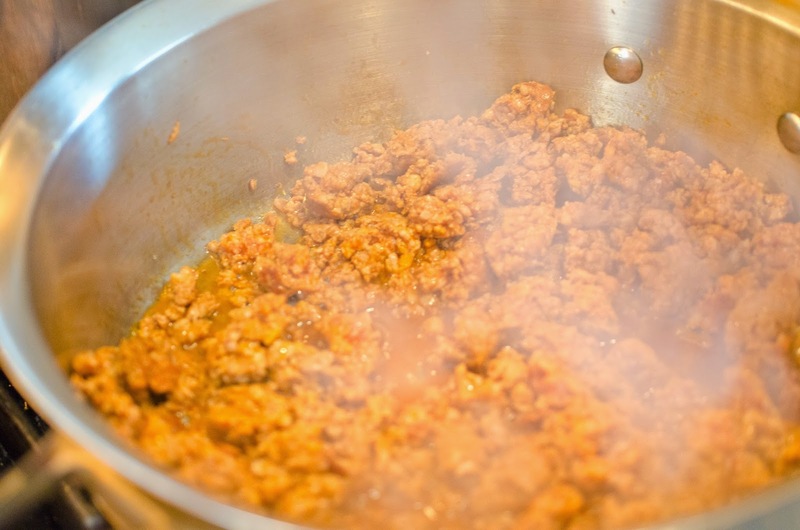 Remove chorizo from the skin, break apart with a wooden spoon and cook over medium heat in a large 12 inch skillet. 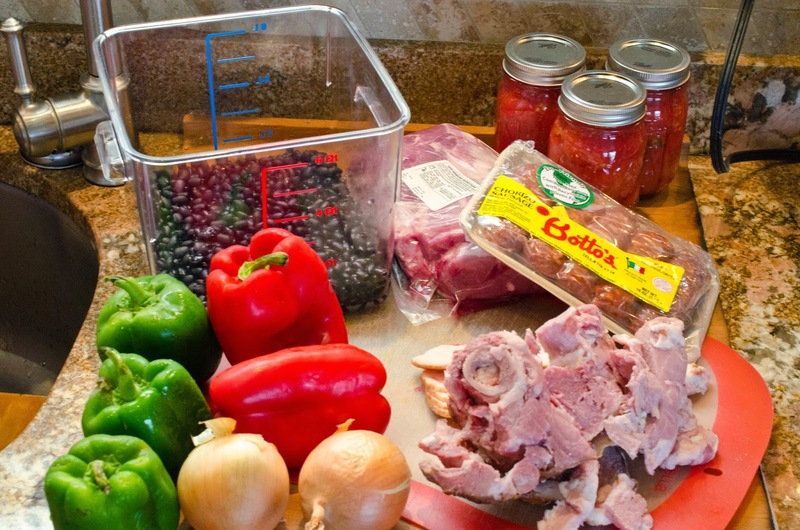 Add the pork to the stock pot with the sauteed vegetables, add drained beans, add whole tomatoes and cut with a spoon. Stir and add red pepper flakes. Cook over medium heat until bubbling.